Puget Sound circulation is driven by tidal currents, the surface outﬂow of freshwater from Puget Sound rivers, and deep inﬂow of saltwater from the ocean; and is inﬂuenced by wind strength and direction. Tidal currents dominate the circulation, and typically a two-layered pattern of estuarine circulation is superimposed on the tides. 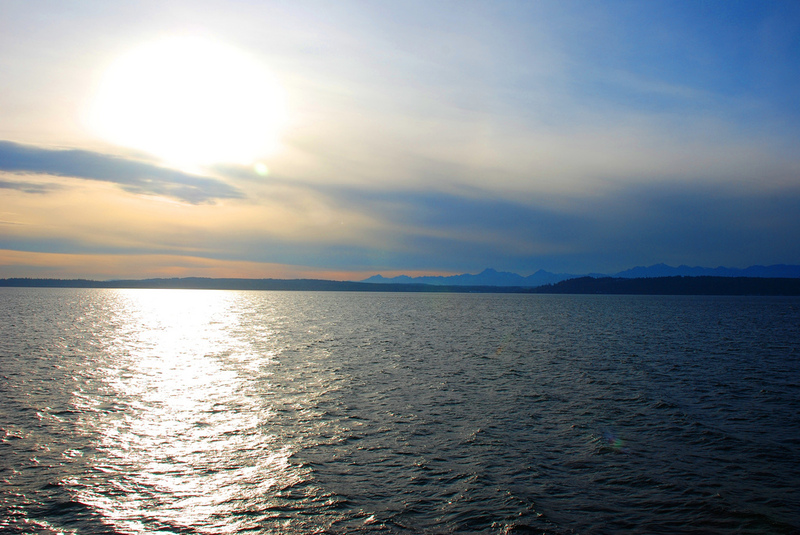 Deep, dense saltwater enters Puget Sound from the Strait of Juan de Fuca through Admiralty Inlet, part of it ﬂowing south into the Main Basin and part ﬂowing north up into Whidbey Basin. The resulting landward-ﬂowing water replaces the bottom water of Puget Sound and keeps it from becoming stagnant, and the out-ﬂowing surface water ﬂushes Puget Sound. The rate at which water ﬂows out of Puget Sound (a net ﬂow after tidal exchange back and forth) is dictated in part by upwelled deeper saltwater and the amount of freshwater ﬂows entering the Sound through the major river systems. Because of shallow sills at Admiralty Inlet, the Tacoma Narrows, and the mouth of Hood Canal, some fraction of the water and its dissolved and suspended constituents do not leave the area immediately, but make additional trips. Within the main basin of Puget Sound, an exception to the typical two-layered ﬂow pattern occurs along Vashon Island, where the outﬂow from the Narrows (up Colvos Passage) is a driving force. The movement of water due to tides is about 5–10 times larger than the actual estuarine circulation observed throughout the Sound. As the tidal currents ﬂow past points of land, the water forms eddies in the lee of the points. These tidal eddies provide a transport mechanism for offshore water to reach the shoreline, bringing nutrients and plankton to nearshore communities. Tidal currents in the main basin of Puget Sound, a region with depths of 200 m or more, typically are less than 0.25 meter per second. In contrast, tidal currents in Admiralty Inlet and in The Narrows, regions with depths of 40–80 m, can be as large as 2.2 and 3.3 m/s, respectively (NOAA, 1984). The large tidal exchanges and distinctive bathymetry and shallow sills within Puget Sound mean that the ﬂushing rate of waters and the sediments and dissolved constituents they carry are restricted and slowed, and the sills prevent sediment, many organisms, and contaminants from readily leaving Puget Sound. Water movement also plays an important role in shaping the location and quality of shoreline, nearshore, and deepwater habitats of Puget Sound. An understanding of general circulation conditions is essential to the assessment of element cycling throughout the ecosystem, as well as site-speciﬁc conditions for locating facilities such as sewage treatment plants. Puget Sound is also a collection of smaller estuaries with various ﬂow patterns inﬂuenced by freshwater input and tidal mixing. Nutrient concentrations in the upper layers of the ocean tend to be lower than in the deeper waters due to their uptake of nutrients by phytoplankton in the euphotic (i.e., sunlight-rich) zone. Replenishment of nutrients in the upper layers can be accomplished through coastal upwelling, vertical diffusion from deeper waters, and contributions from land through rivers, streams, treatment plants, stormwater, and runoff. Certain nutrients, including nitrogen and phosphorus, are necessary for phytoplankton growth. The process of vertical mixing between surface and underlying waters is a major driver of nutrient and phytoplankton dynamics, which in turn affect dissolved oxygen (DO) levels. Stratiﬁcation refers to the horizontal layering of water masses due to density differences. The development of stratiﬁcation within the water column is signiﬁcant because of the physical barrier it presents with respect to vertical water movement. For example, turbulent eddies, driven by winds and tides, cause vertical mixing of phytoplankton, dissolved oxygen, and nutrients. If, however, the water is stratiﬁed, then the ability of turbulent eddies to accomplish vertical mixing will be greatly decreased. This is particularly true at the pycnocline, which is often occurs in the top several meters of the water column. Thus stratiﬁcation effectively isolates the surface water from the deep water. When stratiﬁcation is intense, two environmental conditions can result-–surface waters can become depleted of nutrients (dissolved nitrogen and phosphorus), and bottom waters can become depleted of oxygen. When external supplies of nutrients are increased in a system that exhibits low circulation and stratiﬁcation, the condition can result in dense algal blooms and, after the algae sink and decay, a correspondingly large deﬁcit of dissolved oxygen in bottom waters. Low precipitation can lead to reduced river ﬂows that can markedly affect water properties. For instance, reduction of freshwater inﬂow in the 2000–2001 drought reduced the density difference between surface and bottom waters in Puget Sound. Although weakened stratiﬁcation allows localized vertical mixing, it can reduce the ﬂushing pattern of Puget Sound as a whole. If the pattern of estuarine circulation is weak, the movement of organisms and nutrients in the top layer towards the ocean will be reduced. Altering exchange rates between the Sound and the coastal ocean has implications for the dispersal of numerous small species of open-water invertebrates and ﬁsh larvae as well as water quality within the Sound. Additionally, low freshwater river ﬂows shift the location of the saltwater-freshwater mixing zone, affecting the location of critical rearing habitat for juvenile salmon and allowing saltwater to penetrate further upstream. Sound Science: Synthesizing ecological and socioeconomic information about the Puget Sound ecosystem. 2007. Mary H. Ruckelshaus and Michelle M. McClure, coordinators; prepared in cooperation with the Sound Science collaborative team. U.S. Dept. of Commerce, National Oceanic & Atmospheric Administration (NMFS), Northwest Fisheries Science Center. Seattle, Washington. 93 p.